If you've got a Holstein springer, that means you've got a dairy cow who is due to deliver a calf within a few weeks. To stay in milk production, dairy cows must be bred every year. According to the Holstein Association USA, the average productive life of a Holstein cow is about four years. Known for their outstanding milk production, the black and white Holstein cows are the most common in the dairy industry. Originally from the Netherlands, Holsteins arrived in the United States by the 1850s. There's also a red and white version. At maturity, a Holstein cow weighs approximately 1,500 pounds and stands about 58 inches high at the shoulder. When a Holstein heifer reaches the age of 13 months, she's ready for breeding. By that time, she weighs about 800 pounds. Most cows are bred via artificial insemination, not actual sexual contact with a bull. With a nine-month gestation period, that means she can produce her first calf by the age of 22 months. The Holstein Association USA recommends that cows give birth initially between the ages of 23 and 26 months of age. The transitioning period refers to the time three week before and three weeks after your cow calves. During this time, the animal changes from a "dry" cow, not milk producing and very pregnant, to a new mother with heavy milk production because of lactation. 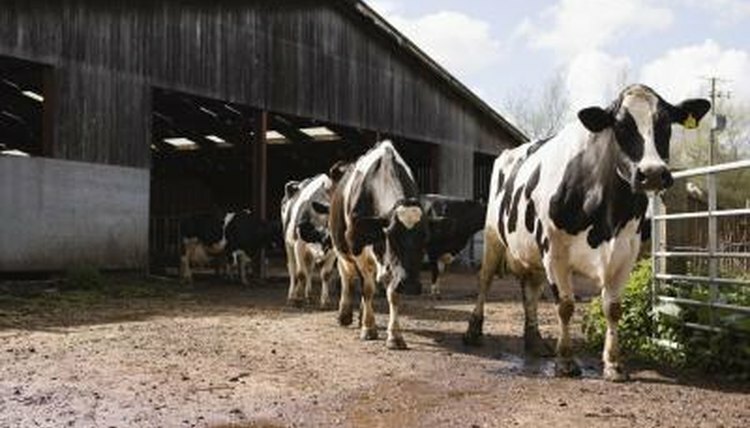 The nutritional requirements of a milking cow, who is now in the milking herd, not feeding her offspring, are far greater than that of the dry cow. Victoria Department of Primary Industries in Australia recommends feeding the springer cow a diet consisting of between 14 and 16 percent crude protein, along with 30 to 35 percent of "neutral detergent fiber." That means the total plant fiber in forage. Regular "dry cow" hay isn't sufficient for springer cows, who require a higher grade of forage. Springer cows should receive concentrated feeds providing additional protein as the calving date draws near. These concentrates also prepare her rumen, the first stage of her stomach system, for the milking diet she'll receive after she calves. Freshening, or calving, means the cow gives birth. Holstein calves can weigh as much as 90 pounds coming out of the womb. Because Holsteins are used for milk production, mothers and babies are separated not long after birth. Calves usually are raised in groups, with the females destined for breeding and milk production in a little over a year's time and the majority of the males raised as veal calves or castrated and fattened up for a year before slaughter. A small percentage of male calves with outstanding conformation and bloodlines survive to become breeding bulls.